It’s been a while since I gave you a sample from my fantasy trilogy, so here’s a bit from SAGE. 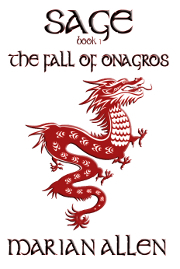 This is from Book 1, The Fall of Onagros. In it, the kinninger (ruler) of the realm, Karol, escapes from the men her husband has sent to kill her. She takes refuge with Moder Zglaria, on an island in the woods. Karol sat on the stone floor; warm, here, from the fire’s heat. She felt she should fear the crafty, fierce old woman, but she didn’t fear her. From the moment she had stepped into the clearing, she had felt… not “safe”… not quite “befriended”… At any rate, she felt she hadn’t made an error in coming to the island. After all that had come before, and all that must follow from it, having made not-an-error should count as a victory of some kind. Karol took a spoonful of the stew, a small one, so it would cool faster, and broke off a corner of the bread. She was starving. She was ravenous. She was dead, and she wanted to be dead, but the life inside her wouldn’t let her die. It was hungry, and the Kinninger ate to feed it, sitting on the stones before the fire. There was movement behind her as she ate her stew and took out more; movement, sound, and a passing chill. As a sign of her trust, she didn’t look around. A cup was held before her. Karol took it, feeling she had passed some sort of test, wishing she could care. She drank the thick milk and, while she waited for her second bowl of food to cool, turned the cup in her hands. It was fired pottery, made of green-gray clay. Copper filigree was fixed around the stem and half-way up the bowl, the copper forming figures. Figures of…. “Where did you come by this, Moder?” she asked. All three books of the trilogy are available in print and for Kindle. Visit my SAGE page for links to all of them and to free chapters. A WRITING PROMPT FOR YOU: A character finds something in an unexpected place. This entry was posted in SAGE, Sample Sunday. Tagged novel excerpt. Good sample. Lots of subtleties, more told my not telling, etc. HEY! YOU! BUY THIS BOOK!! lol! From your mouth to the buyers’ ears!